As Microsoft continues to transition and transform under the leadership of Satya Nadella, its annual BUILD developers conference is the best barometer for what direction they're taking. 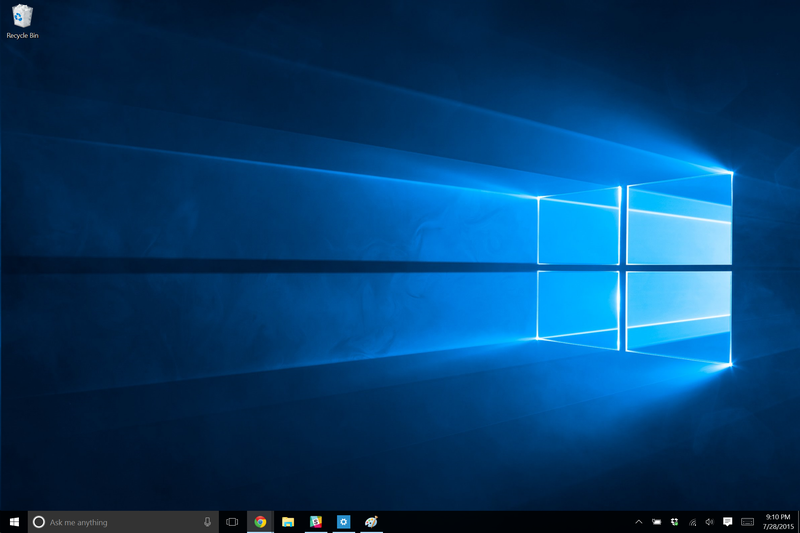 Windows 10 is on a biannual update cycle, and we now have the first details of the fall update. Microsoft is also introduced their own VR motion controllers, and talked a lot about cloud computing. Some of the biggest news to come out of BUILD was the announcement of Microsoft's own Motion Controllers for their Mixed Reality platform. Similar to the Vive wands and Oculus Touch, the controllers feature a touchpad, thumbsticks, a grip button, a trigger, a menu button and a Windows button. The controllers are tracked through the ring of white LEDs at the top. 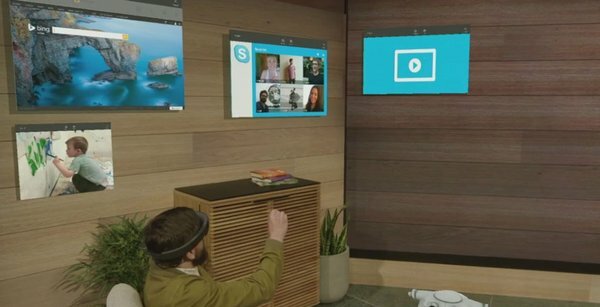 Unlike Oculus and Valve's solution for tracking, which requires external sensors and additional setup, Microsoft opted for inside out tracking for Windows 10 headsets. That means the sensors on the face of headsets will track these controllers as well. This also means they'll only be tracked so long as they're in view of the sensors. The motion controllers will start shipping this August with the Acer developer headset for a combined cost of only $400. This hardware is identical to what will ship for consumers this fall. That's $100 less than the PSVR bundle, and at least $200 cheaper than any other PC VR headset+controllers offering out there right now. Alex Kipman told everyone to stay tuned to E3 for Microsoft's holiday Mixed Reality plans. The obvious implication there is that Project Scorpio's VR solution will be Microsoft's own, and not an existing PC headset as previously suspected. With the Surface Pro, Microsoft designed a tablet that they argued could replace a laptop. Then, they released the Surface Book, which was a high-end laptop that could double as a tablet. And now Microsoft has announced… the Surface Laptop. We've come full circle. And this may be the gimmick-free computer that people have been asking for Microsoft to make for years. The Surface Laptop is a 13.5 inch (2256x1504, 3:2 aspect ratio) ultrabook starting at $1000, coming June 15th with pre-orders available now. The base model has an Intel core i5 U processor, 4GB of RAM, and a 128GB SSD. Configurations currently go up to a core i7, 16GB of RAM, and a 512GB SSD for $2200. Microsoft also stated that a 1TB version would be made available. Those specs are pretty run of the mill for ultrabooks, but Microsoft is also claiming 14.5 hours of battery life, and that no charge will be lost when the device is sleeping. Impressive if true. 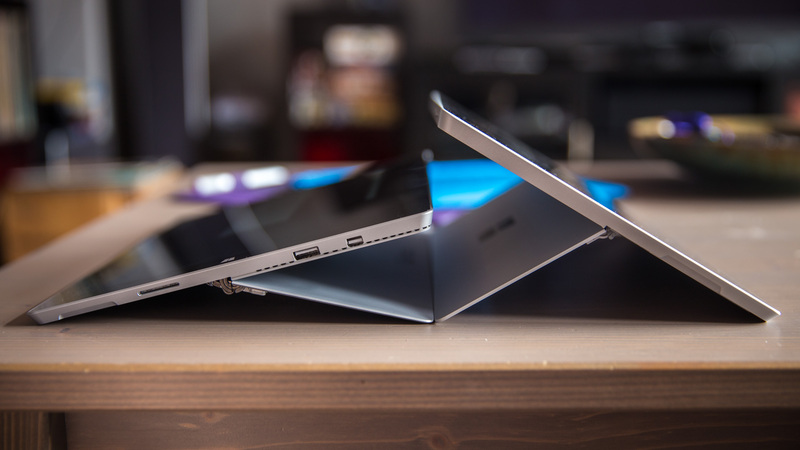 This thin laptop weighs 2.76 pounds, but it's also slim on ports sporting only a USB-A port, a Mini DisplayPort, a headphone jack, and the usual Surface connector port. 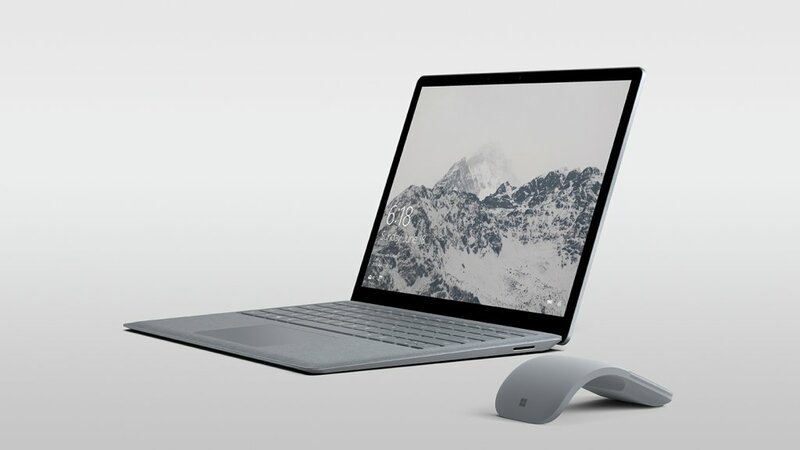 The Laptop has a touchscreen using Microsoft's Pixelsense tech, a Windows Hello camera system, and supports both the Surface Pen and Dial accessories. It comes in four colors; Burgundy, Platinum, Cobalt Blue, and Graphite Gold. For some reason, only the higher of the two i5 models is available in all of the colors, and all other models are only available in Platinum (for now?). It's made out of Aluminum, which is a departure from the Surface line's signature Magnesium. And the Laptop even has an Alcantara fabric finish on the entire keyboard/palmrest area. The build quality was exquisite and it felt very sturdy, despite being so light. I managed to see the Surface Laptop for myself at my local Microsoft Store. Wow. When Panos Panay said his team poured everything they had into all of the little details, he wasn't exaggerating. The build quality was exquisite and it felt very sturdy, despite the fact that it's so light. It felt about the same weight and thickness as my Surface Pro 3 (with a Pro 4 Type Cover), which is a tablet with a 12 inch screen. The keyboard quality was about on par with the Pro 4, so fairly decent, and the trackpad was similar as well, albeit noticeably larger. The Alcantara finish looked great, and felt smoother than the keyboard side of a normal Type Cover. There are actually no perforations in it for speakers either. Microsoft used new technology to put the speakers underneath the keyboard. A public space obviously isn't the best place to judge laptop speaker quality, but from what I could hear there was no muffling of the sound. While Microsoft didn't announce a proper successor to its Surface Book for this holiday, they released an update to the laptop with a Performance Base model. We test the Surface Book with increased battery capacity and a new discrete GPU, as well as update you on what the past year has been like using the Surface Book as a primary work laptop. In what's becoming an annual affair, Microsoft recently held an event in New York City to talk both hardware and software. 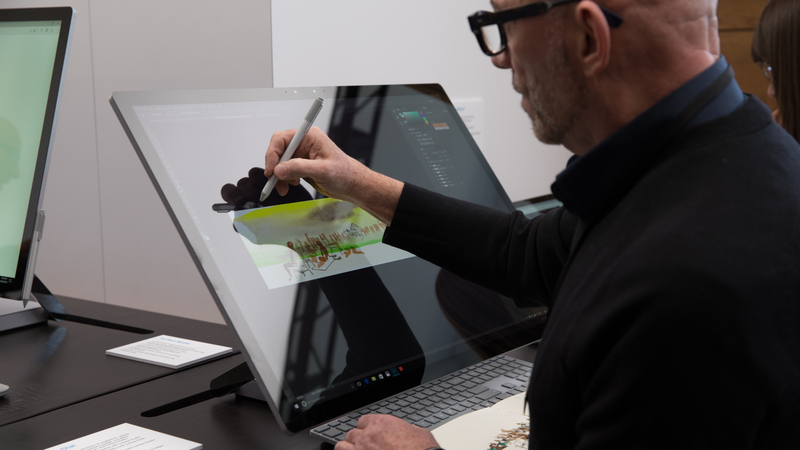 Highlighting the presentation was the Surface Studio, an all-in-one PC for digital artists launching this holiday, and the Windows 10 Creators Update, bringing 3D creative tools to everyone in early 2017. Here's what you need to know about what was announced at the event. From the beginning, Surface has been about making people more productive, to provide the technology and tools for anyone to make anything. As Panos Panay said at the event, "[Surface] moves seamlessly throughout your day. It's about you at the center." The Surface Studio is a high end all-in-one computer, Microsoft's first desktop computer, aimed at digital artists. The Surface Studio differs from many other AIO PCs by putting the components in the base, which ranges from an Intel Skylake core i5 and Nvidia GT965M up to an i7 and GT980M. Paired with this is a 28" 4.5K (4500x3000) 3:2 touchscreen display. It also supports the DCI-P3 color space, which is the most possible of current display technologies. (However, at only 350 nits, the Studio doesn't support any HDR video standards.) One last important aspect to the display itself is its 192 DPI. This, along with scaling done by Windows, makes for a true to life scale on screen. In other words, one inch on screen is equal to one inch in the real world. The Surface Studio starts at $3000 and ships this December. Of course, there's more to it than just that. The screen is on what Microsoft calls a zero-gravity hinge, allowing the display to effortlessly move from upright, down to a drafting angle, and any position in between. The palm rejection software in Windows even allows for you to lay your entire arm across the display for when you really want to get into something with the Surface Pen. We head to New York for Microsoft's announcement of the Windows 10 Creator Update and its shiny new all-in-one Surface Studio computer. Norm sits down with Engadget's Devindra Hardawar to discuss what we've learned about these products and our initial impressions. Computers of course aren't the only devices running Windows these days. The Xbox One's core was updated to Windows 10 last November. The already released Anniversary Update makes adjustments to the new UI and adds some new features. 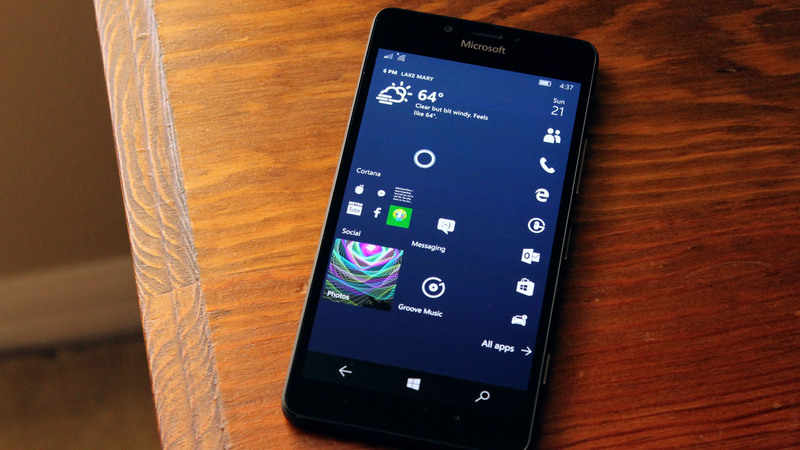 And let's not forget about Mobile, which benefits primarily from recent updates to the many apps of Windows. Similar to PCs, the Anniversary Update for the Xbox One brings a combination of new features, UI tweaks, and software improvements. The most noteworthy change in my opinion is the UI for My Games & Apps. These lists finally scroll vertically and you can fit as many as 30 tiles on screen at once. They can be sorted alphabetically in one pile, by letter like on a phone, last used, last updated, or by size. You have three options for the size of the tiles too. 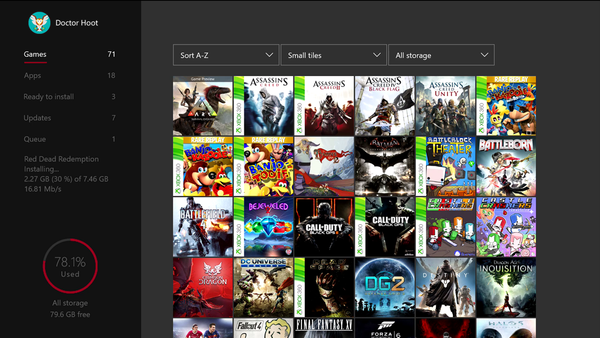 The headache of getting to your ready to install games and apps is nonexistent now with a dedicated tab added to the left column. It's baffling as to why it took so long for this to be updated, but it's finally here. Honestly, the only adjustment I'd like to see made is a separate list for Xbox 360 games. 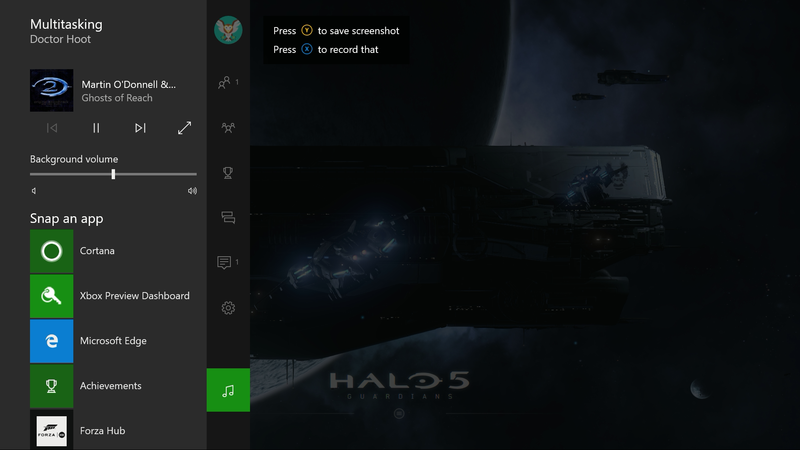 Cortana is also on Xbox now, taking over the old voice commands if you so choose. Microsoft has leveraged their digital assistant here to enable users to use more natural language with voice commands. For example, you no longer have to say the full length of a game title in order to launch it, so instead of saying "Xbox go to Halo 5 Guardians" you can now say "Hey Cortana play Halo 5". And even if you don't have a Kinect, the new voice commands work through a headset as well. The Cortana voice commands started working well only with the last major Preview release, so it's hard to compare using voice commands for a couple of days to a couple of years. But so far they seem to work about as well as the old ones for me, or in other words, most of the time. This Cortana has the same functionality as any other device running Windows 10, so she can do everything from checking the weather, to doing a web search, and even singing songs. 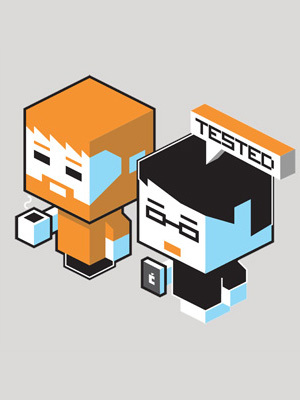 That added functionality can potentially result in more problems however. Having used Cortana for years now, I was fairly certain I could get it to fail. While watching tv, Cortana can change the channel to stations such as ESPN and CNN without issue. However, when I said "Hey Cortana watch HGTV," just as I had suspected, Cortana did a web search for "watch hgtv" instead of going to the channel. I even went into the OneGuide to favorite the channel, which on the old voice commands was supposed to help with similar failings, but I still got the same result. Thankfully, I haven't had any issues yet with Cortana responding while I'm playing a game to do things like recording game clips. If you decide you don't like using Cortana, there is an option in Settings to turn them off and go back to the old Kinect only Xbox voice commands. And background music is back! It's only taken three years, but the secret best feature of the Xbox 360 is now on the Xbox One. The feature wasn't live at the time of this writing, but a new Groove Music app will soon be updated with this long requested feature. It's also open to third parties, with Pandora and the podcast app Cast available at launch. Playback controls will actually be found in the Guide, so no need to snap the app, or of course music can also be controlled via Cortana. Windows 10 was released this time last year, and unlike previous versions of Windows, it's frequently updated, thanks in no small part to crucial, open feedback from users. Windows is essentially a service now. But while you'll likely never see the words "service pack" ever again, Microsoft isn't shying away from major updates. The Anniversary Update is the biggest one yet and includes new features and UI tweaks. I've been running Insider builds of this update for about a month, and Microsoft sent out the final version to Insiders a week and a half before everyone else gets it, for free, beginning August 2nd. Without a doubt the biggest addition are the Windows Ink features. These are mostly under the hood improvements that allow developers to add inking to existing apps and more easily make new ones. In the Anniversary Update they're showcased in something called the Windows Ink Workspace. Acting a bit like the Action Center or Cortana, the Ink Workspace can be accessed from a new icon near the system tray and it slides out from the taskbar. When opened you'll first see Sticky Notes, Sketchpad, and Screen sketch. Sticky Notes have existed as a baked in feature in previous versions of Windows. The difference now is that they're actually kind of useful. Just like a real sticky note, if you're using a device with a pen you can easily jot things down. Cortana can also tie-in to create reminders based on your notes. This isn't automatic however, and will take a few taps every time to complete. There are people out there that love their sticky notes, so now they're here in Windows in a modern way and work well. Microsoft's annual Build developer conference brings together thousands of people from around the world to showcase new development tools and services for use in updating and creating new apps that run across all of Microsoft's ecosystem, from desktop, to mobile, to the cloud, and now, even "holograms". And in the five years that it has been running, Build also gives us a glimpse at what's to come in future versions of Windows. Here's all the important stuff from this year's event. 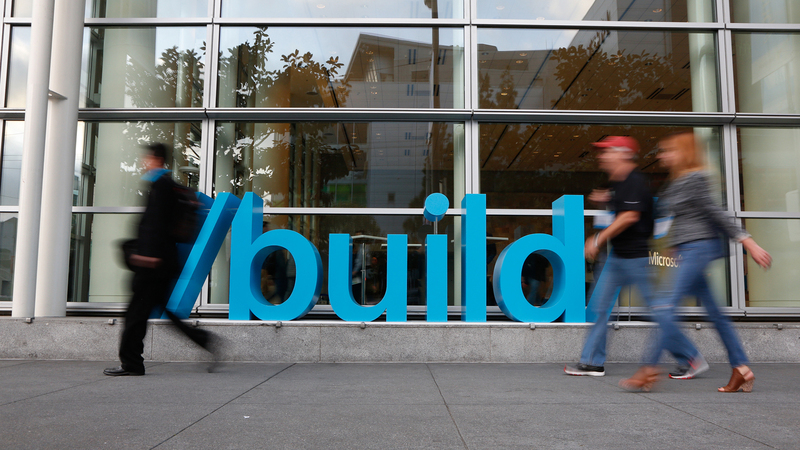 Microsoft Build 2016, San Francisco. 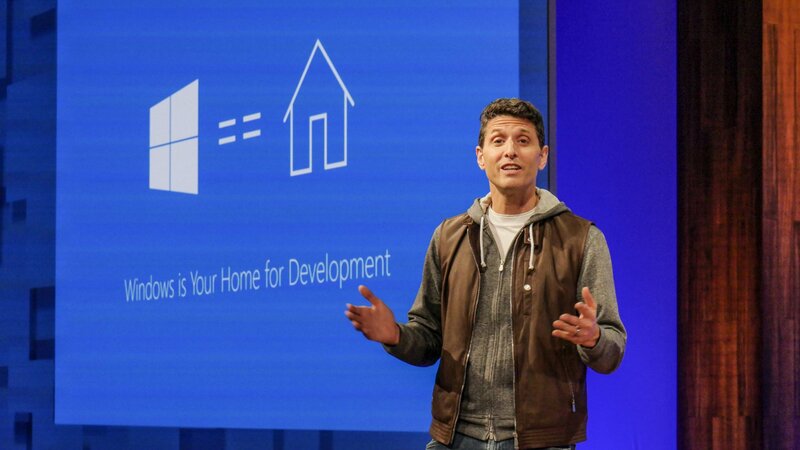 Unlike Google I/O or Apple's WWDC, Build didn't bring with it a developer preview of the next version of Windows with tons of new features. That's because ever since Windows 10 was released in preview form in October 2014, you can always be running the latest and greatest, bugs and all, by enrolling in Microsoft's Insider Program. However, that doesn't mean Microsoft didn't show off some cool new things that are still to come. This summer, Microsoft will begin rolling out the Windows Anniversary Update. Previously known as the Redstone 1 update available right now via the Fast Ring of the Insider Program, this free update will bring new features to all devices running Windows 10, including Xbox and Hololens. The way Windows handles stylus and pen input will see huge improvements through a new platform aptly called Windows Ink. Pen input is a prominent feature of Microsoft's own Surface devices. One feature of the Surface Pen is the ability to open OneNote with a single click of the top button. Well with the Anniversary Update and Windows Ink, clicking the Surface Pen's button will now open Ink Workspace. It comes out from the right side of the screen, similar to the Action Center, and it's essentially a dashboard for all things Pen related. It's unclear if you can change the button to still instantly launch OneNote, but you'll still be able to quickly access apps like OneNote and Sticky Notes via the Ink Workspace. The Microsoft Lumia 950 comes nearly two years after the last Lumia flagship, the Lumia Icon, was released in the US, and a year and a half after the same phone was released internationally as the Lumia 930. 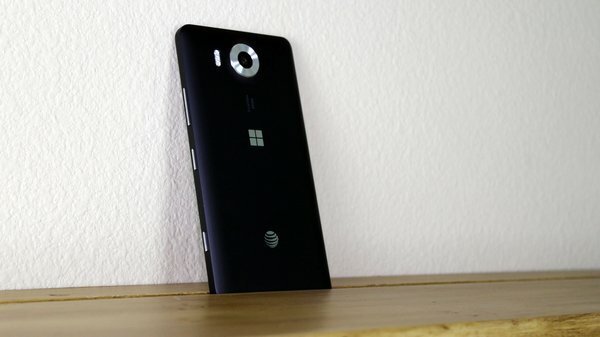 With such a long gap between releases one would expect a noticeably better device, and on paper the Lumia 950 has everything you'd expect from a 2015 high-end phone; a high resolution screen, a hexacore processor, and a 20MP camera. It also showcases Microsoft's new mobile OS, Windows 10 Mobile. I've been testing the 950 for three months, since it came out in late November, and have been an avid user of Windows Phone for over four years. Previous 900-class Lumias could go toe-to-toe with the latest iPhone and Android flagships when it came to specs. In some ways the Lumias were even a step ahead of the competition. This time out the newest Lumia has a 5.2 inch 2560x1440 AMOLED screen, and it's stunning, if not a little excessive. At a ridiculous 564 pixels per inch, even the smallest text appears sharp. That's significantly higher than the retina screens of the iPhone 6S and 6S Plus, at 326 and 401 ppi respectively, and similar to 2015 flagship Android phones such as the LG G4, 5.5" at 538 ppi, and the Samsung Galaxy S6 with a 5.1" screen at 577 ppi. Colors might be a little plain out of the box, but, as with previous Lumias, the color profile can be easily changed. With the ClearBlack polarizing filter and Sunlight readability brightness setting, the screen gets plenty bright even under direct sunlight. And Glance Screen, the fan favorite Lumia feature that provides glanceable information without turning the display on, is back, but the Lumia 950 is curiously missing Double Tap to Wake. Overall, I can't tell much of a difference between this screen, and the 1080p AMOLED screen of the Lumia 930. I can see the reasoning behind having a 2K screen on a 5.7" device. But, on a smaller phone I feel it's excessive and an unnecessary bullet point. I'd much rather have a great quality 1080p display, more battery life, and a potentially cheaper device. Inside the Lumia 950 is a 1.8GHz Snapdragon 808 processor, 3GB of RAM, and 32GB of storage with the option to expand it via a microSD card slot. By now many of you are likely aware of the issues surrounding the Snapdragon 810. While it's technically more powerful than the 808, the 810 runs hotter than previous Qualcomm chips, so the processor's performance is throttled heavily in some phones in order to keep the temperature within reason. I've been testing the iPad Pro for the past week and a half now, using it not only as a go-to tablet, but also as an alternative to a notebook for as many day-to-day tasks as possible. I strapped it inside a Logitech Create keyboard and brought it as my sole computer for a weekend work trip to LA. There's a lot more testing to do--my Apple Pencil hasn't even shipped yet--but I wanted to share with you my thoughts on how the device performs, and where it fits and doesn't fit into my work and home use. Specifically, I want to discuss how it, along with other devices, are changing the conversation and role of what are typically classified as mobile and desktop-class computers. The release of Microsoft's new Surface devices (Surface Book and Surface Pro 4), along with the release of the iPad Pro has renewed the idea of mobile vs. desktop. 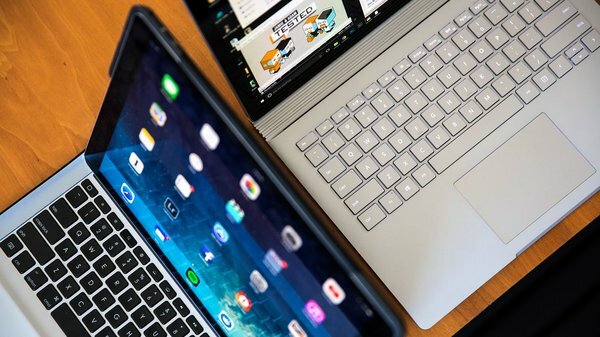 You can find many reviews that boil their evaluation down to whether the iPad Pro can replace a laptop, or whether Microsoft's Surface laptops can replace the need for a tablet. I'm not interested in that head-to-head comparison--the products are set at different price points, and in my mind serve different purposes. Their hardware and software design illustrate different priorities for Microsoft and Apple for their respective families of computing devices. It's those priorities and design approaches that are really interesting; I want to compare what the iPad and Surface lines stand for: a future that's mobile first vs. one that's desktop first. To do that, we should first define our terms. So much of this discussion can get muddled in pointless semantic disagreements. When talking about the iPad and Surface, what categorizes one as mobile, and what categorizes the other as a desktop device? Is it the physical formfactor and size? Having a built-in keyboard? Long battery life? Processor architecture? Touchscreen? App selection? All of the above are important to varying degrees, but I think the difference currently boils down to windowed applications and input models, and how those implementations affect how you can use those machines. For me, the biggest difference in the way you currently use a desktop-class device (eg. a notebook) and a mobile device (eg. smartphone and tablet) depends on whether the operating system employs a desktop model of running programs and file management. As opposed to runnings apps full-screen, Desktop OSes allow for windowed applications to run alongside each other, on top of a virtual and visualized desktop surface. It's a really simple concept to understand, and yet there are grey areas. For example, the home screen on iOS doesn't count as a desktop--it's just an application list, like the Start Menu in Windows. Simple. But on Android OS, being able to arrange files and shortcuts around a launcher screen and run apps in windows makes those devices more akin to desktop OSes, even though Android is typically classified as a mobile OS. Windows 10 is out today, and I've been using the new OS near-constantly over the last couple of weeks. I really like most of what Microsoft has done with the latest version if Windows, it's mostly fixes the mess that Microsoft made with Windows 8, while adding a handful of great new features. Windows 10 represents a big departure for the operating system. Microsoft is calling Windows 10 the last version of Windows. Don't worry, Windows isn't going anywhere, but Microsoft is getting rid of the big annual releases. Instead of upgrades you need to shell out cash for, you can expect to see smaller, more regular, free updates to the OS. While Microsoft reps wouldn't commit to a specific timeline for updates, they said we could expect to see three to four updates annually. The problem with Windows 8 was simply that the OS that Microsoft shipped was designed to be used with touch devices--that sounds great, except it didn't work well with the billion or so computers that didn't include touch and the touch-capable devices didn't really exist at launch. The result was an OS that was based around a decent first attempt at a touch-first operating system that was frustrating for anyone who used it with a mouse and keyboard. With Windows 10, Microsoft is attempting to atone for its tablet-first error. The OS is smarter and more configurable than either of its direct predecessors. Windows 10 behaves like a tablet OS when the keyboard and mouse are missing and shifts to a traditional Windows desktop when you use it with a keyboard and mouse. With widespread support for touchscreens on laptops and a user interface that shifts seamlessly between touch and traditional controls based on the type of input you're using, I can finally see the promise of the convertible laptop. Microsoft's Windows 10 is finally here! We've been testing the beta for months as part of the Insider's Program, and sit down with the latest build right before public release to talk about our experience. We show off the new features, compare it with Windows 7 and 8, and give our thoughts as to whether you should install it. What are your thoughts on Microsoft's latest OS? Norm gets his first demo of Microsoft's HoloLens augmented reality headset! At this year's E3, we went behind closed doors to playtest Project X-Ray, a "mixed reality" first-person shooter demo using HoloLens. Microsoft wouldn't let us film or take photos inside the room, so we describe and evaluate the experience after the demo. We loved using the Surface Pro 3 as a primary laptop, though it was a little too big to use with the stylus as a portable digital notepad. The new Surface 3, though, hits a lot of sweet spots for power and portability. We sit down to discuss its use of Intel's latest Atom processor, the new form factor, and how it stacks up against dedicated laptops and tablets. Despite the weekend excitement over Newegg possibly spoiling Microsoft's announcement of the Windows 10 release date (the retailer leaked a listing citing August release), Microsoft has now confirmed that Windows 10 will be available for download on July 29th. Newegg's product listing did reveal, however, the OEM pricing for Windows--Microsoft will indeed still be charging PC and laptop makers for the OS, despite releasing it to users for free during a one-year promotional period. OEM copies start at $110 ($10 more than previous versions of Windows) and the Pro package is listed as $150. 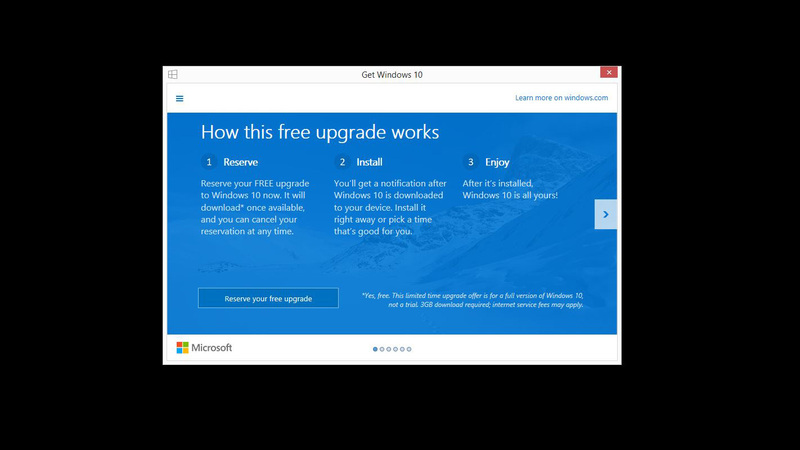 Microsoft also announced how the free upgrade offer will work for existing Windows 7 and 8 users. 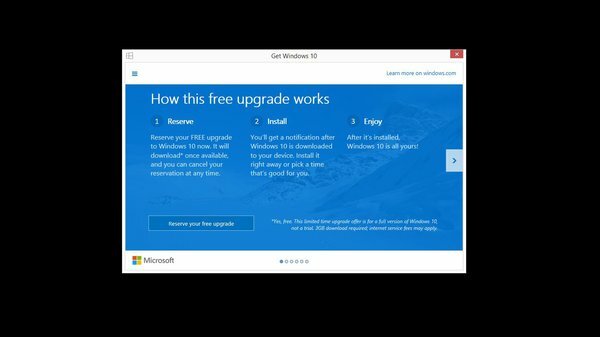 Qualified computers (even pirated copies) can check their system tray today for a Windows icon, which brings up a reservation pop-up to opt-in for an in-place upgrade on July 29th. (Windows 10 "insider" builds also get the notification.) You just have to give Microsoft an email address, hopefully for a product key. This matrix also lets you know which version of the OS you'll be upgraded to. Windows 10 is Microsoft's return to the desktop-first UI paradigm for laptops and PCs, bringing a redesigned Start Menu, Edge web browser, Cortana always-on voice assistant, and new productivity apps. 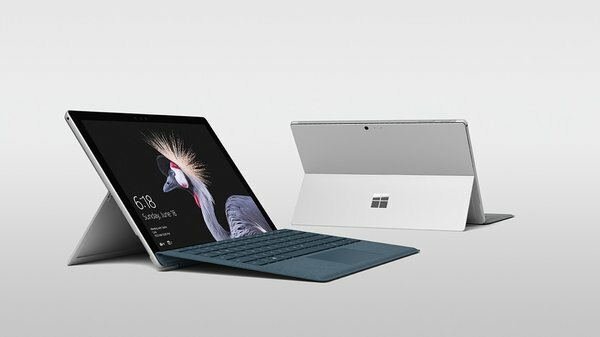 Microsoft's long-standing sales pitch for its Surface computer is that it's the "tablet that can replace your laptop." That tagline is based on the premise that the Surface is to be bought and used as a tablet first, with full "productivity" capabilities enabled with the use of an x86 processor (allowing full Windows 8.1), type keyboard cover, and digitizer pen accessory. But I think it's the other way around: the Surface line--especially the Surface Pro 3--are really competent laptops that can also be used in as tablet alternatives. And with the new Surface 3, which gets rid of the limited RT operating system, that laptop-first positioning is more true than ever. After using it for a while, I've been impressed with the Surface 3's formfactor and performance as a mid-range and travel computer. Surface 3 is a departure from the ARM-based original Surface and Surface 2, and actually has more in common with the Surface Pro 3 (one of my favorite devices of last year). 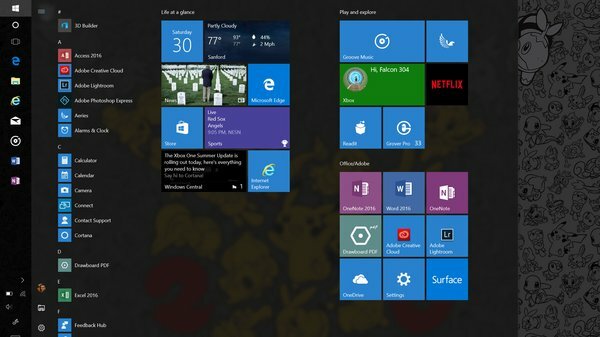 Instead of running the limited Windows RT, Surface 3 now uses an x86 processor and runs the full version of Windows 8.1. That means it can install Desktop applications like Photoshop, Handbrake, and other productivity tools. Physically, its design has also been rethought. It's actually lighter than Surface 2 (1.37 pounds from 1.5 pounds), yet has more screen real estate. That's because its now equipped with a 3:2 aspect ratio display, like the Surface Pro 3. Surface 3 also adopts the new Type Keyboard cover design from the Pro 3, with two magnetic contact strips for increased sturdiness and usability. No more debates about "lapability"--this is definitely a device you can use comfortably on a desk, lap, or even on an airplane tray. Another thing it's inherited from the Pro line--the active N-Trig digitizer pen, which makes it a really great digital notebook, if not Wacom tablet alternative. 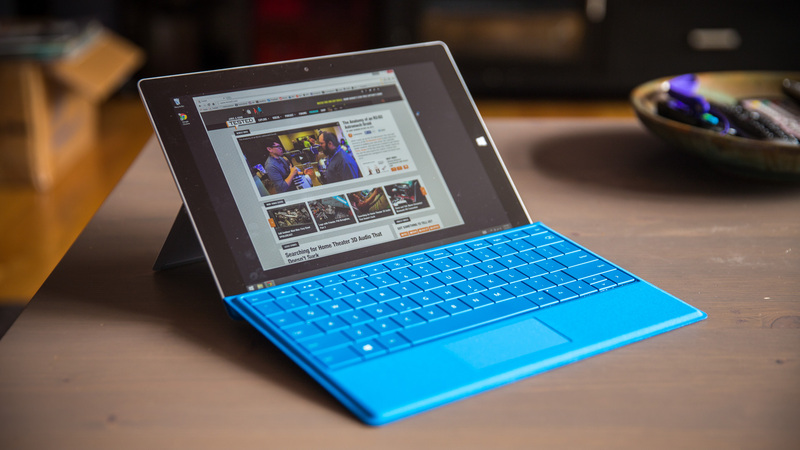 Surface 3 is essentially a lightweight version of the Surface Pro 3, both in terms of formfactor and performance. That's a really good thing. There are some other notable differences, though. The kickstand only locks in three positions, unlike the Pro 3's versatile hinge. That's perhaps a space-saving choice, but more likely a cost-saving measure for Microsoft. But on the plus side, charging is now done over a microUSB port instead of a proprietary connector. That's a net-positive, though charging does take longer on the Surface 3 than other laptops. Testing the Surface 3 was an interesting exercise in trying to understand Microsoft's design decisions for the product. They seemingly spared no expense with some aspects of the devicethe build quality and display, for example. But they also seemed to have made some cost-cutting choices in other areas that affect performance. We'll start with the good stuff, and then talk about the tradeoffs. Intel's Core-M laptop processor has been getting a lot of attention of late, and not under the best light. Even though these ultra-low power CPUs were released late last year in a bunch of Windows notebooks, the platform got a ton of attention when Apple put it in the controversial new MacBook line. As we've found in our tests, Core-M effective made the MacBook Apple's slowest Mac device--mid-range performance at a high-end price. And on the PC side, our experience with Core-M hasn't been much better. Performance throttling of Core-M on the Lenovo Yoga Pro 3 made it a step backward for that series of laptops. Manufacturers clearly get the appeal of a fanless laptop design, but they're putting Intel's chip in premium systems that tax it too far. It's not until the Asus Zenbook UX305 that I've finally found what looks like the most appropriate use of Core-M: a fantastic mid-range system that costs just $700. After using the UX305 for a few weeks, I'm convinced that this is the best laptop you can buy for the price. In discussing my testing of the UX305, I have to acknowledge that it was research into the MacBook that lead me to this laptop. Many Windows users in tech forums pointed to it as a counterpoint to Apple's new laptop, citing its use of Core-M. But aside from that shared CPU architecture, these are actually very different systems, made for very different users. 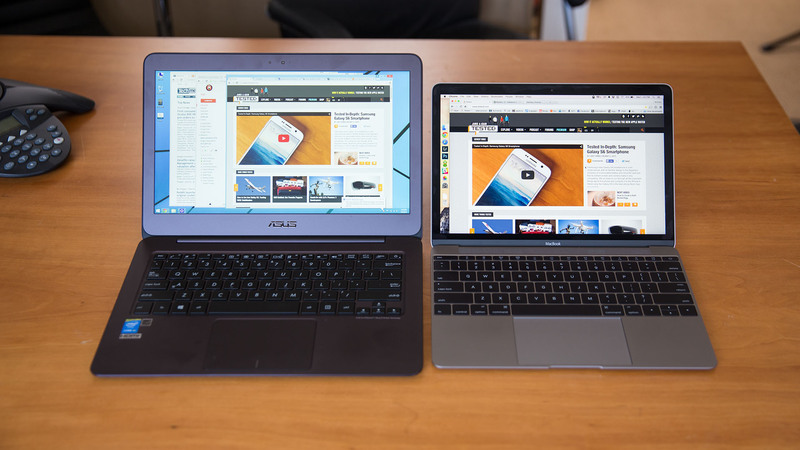 In fact, the more apt comparison would be with Apple's 13-inch MacBook Air. Just look at the size and dimensions of the Zenbook. It's not a design that was whittled away to be as thin and light as possible--and that's totally OK. The generous bezel space around the screen and keyboard areas makes this more a traditionally designed ultrabook than a Dell XPS 13. And with its 13.3-inch screen, the Zenbook is still thinner and lighter than the 13-inch MacBook Air at half an inch (12.5mm) thick and 2.64 pounds. I've never lived with a 13-inch MacBook Air long-term, but the UX305 is a very comfortable size for a daily carry or walking around with at the office. Under the hood, the UX305 uses Intel's Core-M 5Y10 processor, which is actually clocked at .8GHz and turbo boosts to 2.0GHz when needed. The CPU is supported by the standard Intel HD5300 integrated graphics chip, 8GB of RAM, and 256GB of SATA-based solid state storage. I'll talk about real-world performance in a bit, but want to note that the amount of stock SSD storage is exceptional for a laptop of this price. It's not a PCIe-based storage system, but that's totally fine for a laptop that's not meant for heavy photo or video work. Storage was also divided into two partitions, but it's easy to merge the two when first setting the Zenbook up. 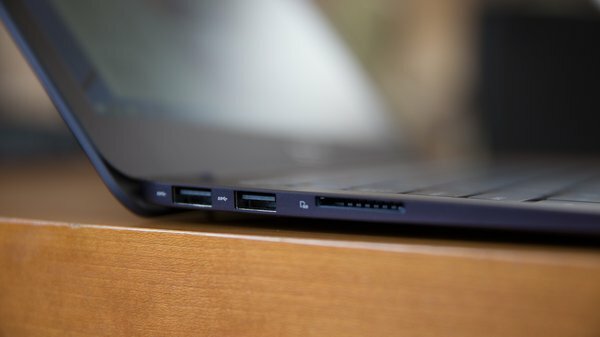 On the sides of the laptop are three USB 3.0 ports (one that supports fast charging for smartphones), headphone jack, power port, micro-HDMI, and an SD card reader. The USB ports were as fast as any I've tested, but the SD card reader transferred files from my Sandisk Extreme Pro card at around 40MB/s, which is on the low side of built-in readers. Today marks the beginning of BUILD, Microsoft's annual developer keynote. Unlike Google and Apple, Microsoft actually devotes a considerable amount of time to sharing information of interest to actual developers, so the keynote was heavy on code demos, APIs, and integration with existing products, like Office. However, there were a handful of interesting notes for normal folks. From a personal level, the most interesting portion of the keynote was the Windows Holographic demo. Holographic is Microsoft's augmented reality operating system, designed to be run on standalone Hololens hardware. Along with a handful of tech demos, we got the first glimpse of an actual user interface for augmented or mixed reality computing. In addition to representations of traditional windows, which look like flat windows, hovering fixed in space, staying in the same area relative to your head, or hovering a few inches off of a convenient wall. Microsoft also showed some three dimensional representations of data. The interface was controlled using a combination of gestures and voice commands. Compared to the January unveil, the registration between the actual and virtual worlds seemed to work much better. There were a couple of skips and jumps, but overall it was a much more polished experience than we'd seen before. There still isn't any actual information about how HoloLens works, but we're hoping to get some hands on time with the hardware and software later this week. Compared to the January unveil, the registration between the actual and virtual worlds seemed to work much better. The windows seem to float a couple of inches off of the wall, complete with drop shadows. The interface seems to be gesture and voice based. It seemed that the brunt of the user interface happens with voice control, using simple air taps to place windows and objects. When you say "Follow me" the window stays in the same position relative to your head. Microsoft also announced that traditional Windows apps, the ones that run on your Desktop, will be coming to the Windows Store. You'll be able to buy and install them in the same way that you can buy and install Modern apps on the Windows Store today. Those applications will run in a sandbox, but they'll behave just like traditional Windows applications, on your Desktop. Developers can reuse Java and C++ code from Android versions of their apps for phones running Windows 10. Windows phones will include an Android subsystem that lets you use native Windows features, like Live Tiles in the Windows versions of your Android apps. Project Spartan, the new browser that's replacing Internet Explorer in Windows 10, will be known as Microsoft Edge.